Rich chocolate cakes are often the definition of decadence, so decorate them to reflect their mouth-watering flavor. These designs work for nearly every occasion. Decadent nougat dollops are interspersed with chocolate bar pieces, shavings, and caramel syrup. A light dusting of powdered sugar adorns the over-the-top creation. Keeping the design on one side of the cake adds a touch of easy elegance. Traditional chocolate shaving curls are piled on this cake. It also features a ridged side with ganache dripping down those sides. A star tip with buttercream frosting outlines the top and bottom of the cake to pull the design together. This cake is frosted and then covered in sifted cocoa powder. Toasted marshmallows are added to the side, and small pools of dark chocolate ­ganache create an original design. A bit of edible silver adds sparkle. Candied raspberries, cherries, and blueberries top this chocolate cake. The bright colors offset the darker chocolate icing. Abstract chocolate pieces adorn the sides and top. If you don't have candied fruit available, try using crystallized fruit instead. Chocolate and caramel are a classic combination that also looks as great as it tastes. A thick layer of dark chocolate fudge filling or frosting is swirled with caramel to produce a tasty contrast here. 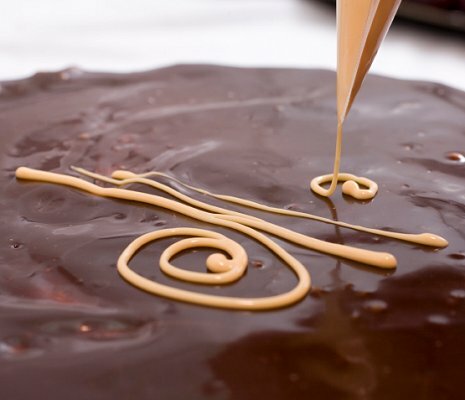 Small caramel chocolate bars help outline the haphazard edges. Caramel sauce is drizzled in a freehand grid on top of this cake. Chocolate buttercream rosettes line the edges while small squares of chocolate and white chocolate pieces help outline the top edge. First, cover the cake in chocolate ganache. While it is still wet, swirl a white royal icing glaze around the cake top, starting in the middle and working your way to the side. Pull a toothpick from the center of the cake to the edges to create the design. A thick layer of fudge frosting makes it easy to create this design. Use fork tines to create the ridges on top of the cake. Thin pieces of chocolate cover the sides. Slicing the cake before serving allows you to create uniform designs on each slice. Place a chocolate truffle on the edge of each piece, then dust with orange or lemon zest. Choose the flavor that complements your cake's fruit filling. Pirouette cookies divide the top of this cake into candy-filled sections. Fork tines create the designs on the edge, and a colorful bow ties it all together. This design is easily customized when you choose your favorite candies. Just because you're decorating a chocolate cake doesn't mean you have to skip roses. Large blooms can be molded from modeling chocolate. Add small green leaves to set the rose apart from the ganache frosting. Mirror glaze is modern, and this cake uses a chocolate version. Add in white for a classy look or a bright color for a vivid pop. If desired, you can add a few sprinkles or edible leaf to the top as well. This German chocolate cake makes use of the classic flavors in its design. Cover the top in the traditional coconut pecan frosting, but add a border and center dollop using a star tip. Cover the bottom of the cake sides in toasted coconut. This contemporary artful design features an abstract look. Small chocolate pieces adorn the sides while the top features a mirror glaze. The center of the cake includes chocolate ruffles, a chocolate stick, cocoa-covered geometric shape, and striped white chocolate pieces. Berries might be the traditional fruit for a cake, but you don't have to stick with them. Nectarine slices are arranged in a swirl pattern on top of this naked cake. Naked cakes are ones where the sides are left unfrosted or very lightly frosted. You're not stuck using candies and white chocolate on chocolate cakes. Bright yellow fondant flowers placed on this heart-shaped cake make it pop. Use your favorite color and this simple design will shine. A rustic, nearly naked chocolate cake features a strawberry frosting with large meringues on top. The strawberry meringues add interest and flavor to an otherwise plain cake. Slices of strawberries finish the design. Elegant, edible gold leaf gives this cake a luxurious look. Raspberries and a white chocolate truffle are offset by the dusting of the gold leaf. It's perfect for a special occasion. Use cocoa powder instead of powdered sugar to create a stenciled cake pattern design. Place the stencil on top of the cake and then dust cocoa. Carefully lift the stencil off and add other decorations, like strawberries and truffles. A light dusting of white powdered sugar creates contrast. Modeling chocolate or chocolate candy melts can be formed into large ruffles to place on top of this cake in a lovely design. Slightly angle each row outward to make them look almost like petals. Sifted powdered sugar finishes the cake. It doesn't matter what occasion you need a chocolate cake for - whether it's a birthday, shower, or retirement party. What matters is that it looks as tasty as it will taste when everyone grabs their slice!